Rocket German Review - Does it work? Note: I received a free copy of this product for review purposes. Some links in this review might be affiliate programs, so I'll make some coffee money if you buy. You get it at the normal price though! 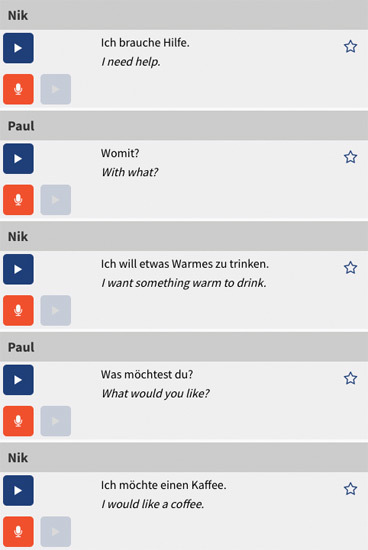 Rocket German is an online German course and app from Rocket Languages. 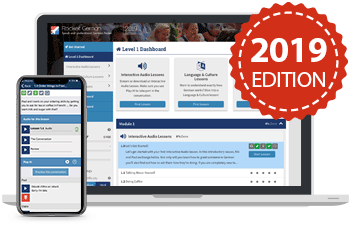 It comes in three levels — Premium (level 1), "Premium Plus" (level 2) and "Platinum" (level 3), making it suitable for beginner to intermediate German learners. Rocket German doesn't have quite the same flashy marketing as bigger names like Rosetta Stone, Pimsleur or Fluenz, but you'll see a lot of people talking about it. The basic idea behind Rocket German is that there's not much point learning a whole bunch of grammar and vocabulary right at the start. Instead it's better to focus on the most essential words, rules and structures that will quickly get you out there and speaking and understanding German in the real world. The theory goes that once you have this basic knowledge, you can use it to flesh out the rest of your knowledge. You might not learn the word for "pen" in the course, but you will learn how to say "what is this called in German? ", and with that you can quickly figure out the rest. This makes it sound like Rocket German will get you "functional" in German a lot faster. But does it actually work that way? The first place you start in Rocket German is with the "Interactive Audio Course". The Interactive Audio lessons are essentially podcasts. You can listen to them on your computer, download them to a music device, or access them through the app. They're all around 20 minutes long, which is a good length for me: Long enough to learn something, but not so long that it gets dull. Confession time: In the past I've hurled a lot of criticism at language audio courses for teaching useless stuff at the beginning. Stuff like how to book a hotel room over the phone. Who does that anymore? But Rocket German teaches you something much more useful: Within the first three interactive audio lessons you've learned how to how to order a coffee in German. And it gets better: You've learnt how to go from a polite "I would like a coffee", to a more urgent "I need a coffee", all the way to "GIVE ME A COFFEE!". While coffee is important to me, what's more important is that I learned how to say "I would like…" "I want…" "I need…." "give me…". These are important tools for surviving in a German-speaking area, so Rocket German gets you using them right at the start of the audio course. 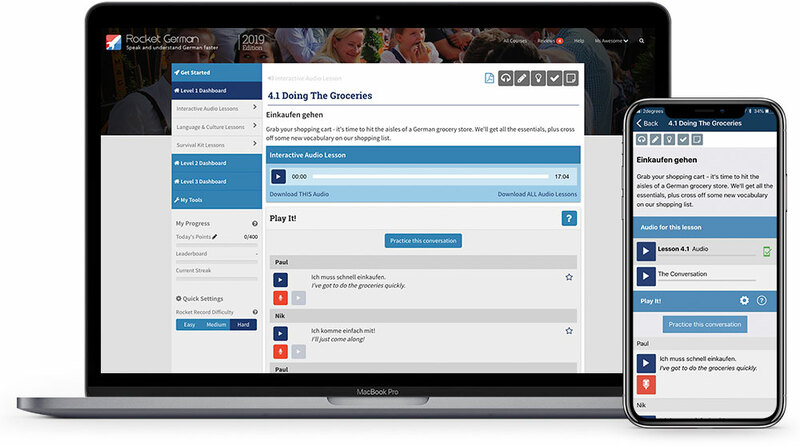 The Interactive Audio lessons are structured around a conversation. When the lesson starts, you'll hear a Pretty Intimidating Conversation, and then over the next twenty minutes Nik and Paul will break it down. In these audio lessons you'll do a lot of pronunciation practice (occasionally right down to individual syllables — useful for those really long German words) and you'll learn a bit about how the words work. Most importantly, you'll learn how to use all those words and constructions in a variety of other ways, so you can quickly start joining in real life conversations. A word of warning: I didn't have high hopes for the audio course with the introduction lesson: The English female host, Nik, was far too perky for my ears, and the jokes were a bit lame. It also seemed to take a long time before they actually got into any meat. But after the first lesson things improved. I was surprised how much I learned just from dissecting one little conversation. I also started to enjoy Nik's perkiness … her enthusiasm became endearing, and it made it easier to push through and stay engaged. I think it would be extremely useful if you need a quick crash-course in practical German. In fact, if you're heading on vacation and you just need some survival German, it might be all you need. The audio course covers the most essential German you need to survive, and it gets you "functional" fast. But if you want to become fully fluent in German, the audio course isn't going to get you all the way there. This is more like a traditional-style German course. They cover in greater depth all of the nitty-gritty that the audio course skims over. The explanations are straightforward, and there's a lot of that lovely clear audio built-in, so you can practice hearing and speaking the words. The "language and culture" lessons go into more depth than the audio course. There's audio and pronunciation practice for almost every audio example. One of my biggest weaknesses when learning a new language is that it's tempting to skip through the material too quickly. I think I understand it, so I move onto the next section. Then it all evaporates from my memory when I need it most. Rocket German gives you a bunch of tools at the end of every lesson to make sure you've fully mastered every single angle of the material before you move onto the next step. It tests your listening, your writing, your pronunciation, and your ability to find the right words when you're under pressure! The tests use a self-rating system (so it's up to you to be honest) and spaced-repetition (so if something is difficult, you'll keep seeing it until it's easy). I've found these exercises challenge me to slow down and really learn the material, and my recall and confidence is better. 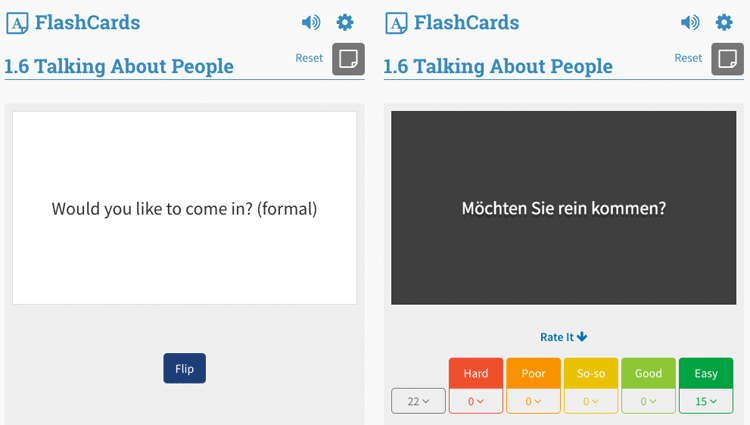 One of my favorite tools is the flash card game — simple but effective. Each lesson comes with a corresponding set of flashcards, or you can create your own to focus on words and phrases that you really want to practice. I will add this to my "things NOT to say to a vampire" collection. If you've ever been afraid to speak your German out loud, for fear that nobody would understand you... you'll like this next feature. 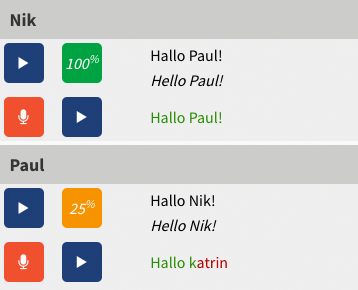 Every single audio example in Rocket German has a voice-recording tool built in, so you can record your pronunciation and see how good it is. In the first example, I got it right. In the second example I said the wrong name. Rocket German uses red text to highlight where you went wrong. The tool is based on similar voice recognition technology to the technology in your phone that lets you give it voice commands. The idea is that if you can get it to understand your German... you'll probably be easily understood by an actual German-speaking person. Right? There are three difficulty levels that are supposed to require more refined pronunciation. In my testing I didn't notice much difference between the levels, but it could simply be that my German pronunciation is sehr gut. You can try it out on the Rocket German website, about halfway down the page. Who is Rocket German suitable for? Anyone who needs a fast grasp of some German basics: The Interactive Audio Course is a great introduction. It's fun to listen to, teaches you a surprising amount, and it gives you real, usable German building blocks from very early in the course. Anyone who wants to become fluent: The addition of the "language and culture" lessons means you can dig deeper and learn more grammar and vocabulary. Rocket German comes in three levels so you can go all the way from beginner to advanced. German learners who have trouble getting German to "stick": The testing tools are really useful for locking the material into your memory, and they're fun as well. Anyone taking a German course who wants extra help: The "language and culture" courses and testing tools can be used alongside another course for revision and practice. It gets you understanding and speaking German fast: The audio course is a perfect crash-course in useful German, and is perfect if you're heading on vacation. Even if you only use the audio course, you'll learn a lot. It's good for different learning styles: Rocket German offers different approaches to learning German. You might learn best through tests and games, or through listening to the audio course, or by reading through the lessons. You can pick the strategy that works best for you. It's entertaining and a little bit goofy: Even though the audio course hosts might sound ridiculously perky and nerdy, they're warm and friendly and fun to listen to. There's also a sense of humor that weaves its way through Rocket German. It makes it easier to swallow the more boring parts of learning a language. There's an app for iOS and Android so you can do the entire course from your smartphone or tablet. No software to install. It's an online course, so you just go to their website, log in, and it all works. No need to download anything or muck around installing things. It just works. Good bang for buck: At the time of writing this, you can get the first level for under a hundred bucks. That gets you 33 interactive audio lessons, 31 "language and culture" lessons, 2051 voice comparison phrases, 61 flash card sets, and the full suite of testing tools. That is a LOT of material, and it will take you a long way towards fluency. If you're after value for money, this is for you. No monthly fees: It's a one-off purchase, so there are no ongoing subscription charges of any kind. You'll also get free updates for life, so you don't have to worry about it getting outdated. There is a 60-day money-back guarantee. This is the real clincher for me. You can buy it, try it, and if you don't think it'll work for you — get a full refund. Because it's an online course, you don't even need to pay for return postage. Allows you (possibly) too much freedom: The layout lets you jump around to whichever lesson you like, and doesn't require that you pass tests before moving ahead. This gives you the freedom to use the course however you like, but it might be too easy to push ahead before you've truly mastered material. Occasionally pedantic tools: On a couple of occasions the testing tool told me I was wrong, when I was technically correct. 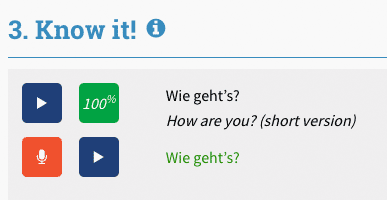 (For instance, when I gave a shortened "wie geht's?" instead of the full "wie geht es dir? ", or vice versa.) On the plus side, there was an option to report an issue with the phrase — so I did — and I received a courteous email from customer support within a couple of days saying that clarification had been added to the tool. Nice! The course gives you a lot of freedom and flexibility to find your best style of learning, and it provides motivation to keep going and (in a way) become addicted to practicing your German. The "most essential language first" approach is very effective in the Interactive Audio Course. 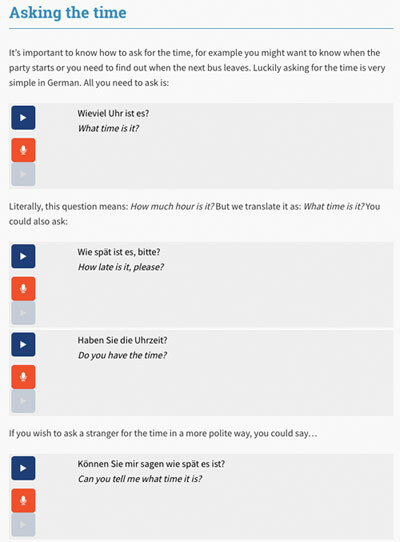 After going through these lessons I felt like I could drop into a German-speaking area and muddle my way through pretty well, even if I didn't understand the finer points of the language. The addition of the "language and culture" lessons means that when I do want to learn those finer points, I don't need to buy anything else. With a friendly community, responsive support team, no ongoing fees and 60 day money-back guarantee, Rocket German offers an effective course and excellent value. Gold star for you, Rocket German! Hey! Want to try Rocket German free for 6 days? Get it here!